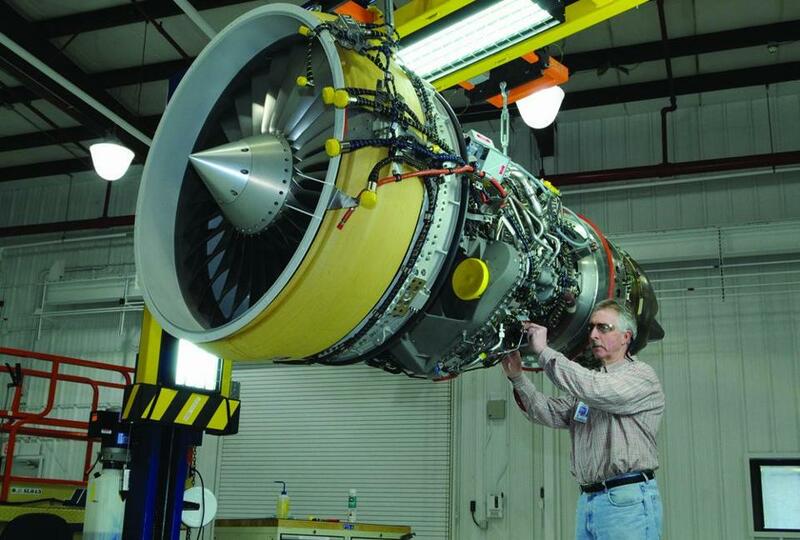 GE employee Mark McDonough inspected a CF34 commercial jet engine at the Lynn General Electic plant. LYNN — It’s a long way from the Seaport and a gleaming new headquarters. Union officials from the General Electric aviation plant in Lynn gathered in the down-at-the-heel offices of Local 201 on Thursday afternoon, looking up at an old aerial photo of their workplace. They ticked off the buildings that have disappeared over the last 30 years, demolished by changing technology, hard times, and cheaper labor: buildings 88, 69, 67, and more, all gone. Gone, too, are most of the luncheonettes and bars that lined Western Avenue — once jammed with local workers. The plant, which employed close to 13,000 in 1985, has been shrinking ever since. There are now about 3,000 workers building and testing aircraft engines in Lynn, half of them union members. In Lynn, workers don’t know what to think. Will nearby bosses be more likely to preserve their high-skilled jobs? Or will they have more cover to erase them? “There will be more . . . donations to charity, that allows them to lay us off without looking bad,” predicted Pete Capano, union president. There are some hopeful signs, like the solar farm planned for the plant, which seems like a sign of commitment. On the other hand, GE has a long track record of protecting its shareholders over its employees — moving operations to other states, or countries, to take advantage of lower wages. “Ideally you’d have every plant you own on a barge,” former CEO Jack Welch once said, as if there were no actual people involved. But along the way, thousands of those people have been laid off. This year, GE will close its valve factory in Avon, leaving 300 blue-collar workers without jobs, and move the work to Florida. There will be new white-collar jobs at a GE Healthcare headquarters in Marlborough, but that doesn’t give anyone in Avon any comfort — especially now that their tax dollars are subsidizing their former employer’s move to Boston (and away from Connecticut, where others will suffer). On Friday, GE announced it will aggressively restructure in 2016. Translation: Workers, watch out! But hey, that’s the way it goes, especially when it comes to manufacturing. To stay competitive, Local 201 leaders made many concessions, selling them to members on the company’s promise to bring new jobs to Lynn. Which haven’t arrived yet. “It reminds me of that guy: ‘I got your dollar!’ But it’s on a rope, and he keeps pulling it away,” said Jay Walsh, a plumber at the plant. The workers have to play by the new rules. Even though the company they work for is masterful at getting around them. GE’s effective federal tax rate between 2008 and 2013, when its profit was about $34 billion, was negative 9 percent. Kind of makes our millions in subsidies seem pathetic, doesn’t it? And this company, so adept at avoiding taxes, has also benefited from immense government subsidies — a whopping $550 million from state and local coffers since 1992, and almost a billion in federal tax credits since 2000, according to Good Jobs First, a D.C. nonprofit that monitors such incentives. But why should GE obey the market if it doesn’t have to? The only people at the mercy of the market are those without resources to get around it — like the workers in Lynn. Chumps!